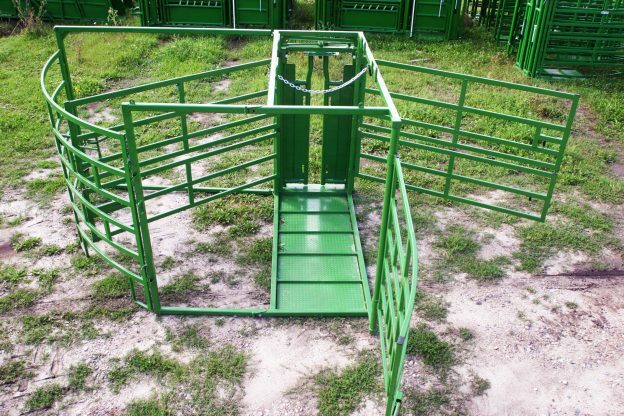 With the split front gate, 6-foot rear access door, and an additional point of side entry, you have numerous options for moving and manipulating both cow and calf among the heavy duty tubing frame and gates of this innovative maternity pen. The heavy duty automatic headgate on our maternity pen may seem over the top for a pen like this, but when you’re dealing with an anxious cow, you’ll be glad Real Tuff pulled out all of the stops on this one. Security and stability will be assured when you place any cow in this pen so that you can focus on the task at hand without concern about the effectiveness of your equipment. Although this pen is advertised as a maternity pen, it is truly a multi-use pen due to its flexibility of use and versatile nature. You’ll find yourself using it for far more than just a maternity pen, just like we have. Watch the short video below for more information and a demonstration of the Real Tuff Livestock Equipment maternity pen. If you don’t already have one of these in your equipment collection, you won’t regret making the addition. We guarantee it! Contact us with questions.